'When I came into office, I promised to look at the world's challenges with open eyes and very fresh thinking. 'We cannot solve our problems by making the same failed assumptions and repeating the same failed strategies of the past. All challenges demand new approaches. 'My announcement today marks the beginning of a new approach to conflict between Israel and the Palestinians. 'In 1995, Congress adopted the Jerusalem Embassy Act urging the federal government to relocate the American Embassy to Jerusalem and to recognize that that city, and so importantly, is Israel's capital. This act passed congress by an overwhelming bipartisan majority. And was reaffirmed by unanimous vote of the Senate only six months ago. 'Yet for over 20 years, every previous American president has exercised the law's waiver, refusing to move the U.S. Embassy to Jerusalem or to recognize Jerusalem as Israel's capital city. Presidents issued these waivers under the belief that delaying the recognition of Jerusalem would advance the cause of peace. Some say they lacked courage but they made their best judgments based on facts as they understood them at the time. Nevertheless, the record is in. 'After more than two decades of waivers, we are no closer to a lasting peace agreement between Israel and the Palestinians. 'It would be folly to assume that repeating the exact same formula would now produce a different or better result. Therefore, I have determined that it is time to officially recognize Jerusalem as the capital of Israel. While previous presidents have made this a major campaign promise, they failed to deliver. 'Today I am delivering. I've judged this course of action to be in the best interests of the United States of America and the pursuit of peace between Israel and the Palestinians. This is a long overdue step to advance the peace process. And to work towards a lasting agreement. 'Israel is a sovereign nation with the right, like every other sovereign nation, to determine its own capital. Acknowledging this is a fact is a necessary condition for achieving peace. It was 70 years ago that the United States under President Truman recognized the state of Israel. 'Ever since then, Israel has made its capital in the city of Jerusalem, the capital the Jewish people established in ancient times. Today, Jerusalem is the seat of the modern Israeli government. It is the home of the Israeli Parliament, the Knesset, as well as the Israeli Supreme Court. It is the location of the official residence of the prime minister and the president. It is the headquarters of many government ministries. 'For decades, visiting American presidents, secretaries of State and military leaders have met their Israeli counterparts in Jerusalem, as I did on my trip to Israel earlier this year. 'Jerusalem is not just the heart of three great religions, but it is now also the heart of one of the most successful democracies in the world. Over the past seven decades, the Israeli people have by the a [sic] country where Jews, Muslims and Christians and people of all faiths are free to live and worship according to their conscience and according to their beliefs. 'Jerusalem is today and must remain a place where Jews pray at the Western Wall, where Christians walk the stations of the cross, and where Muslims worship at Al-Aqsa Mosque. 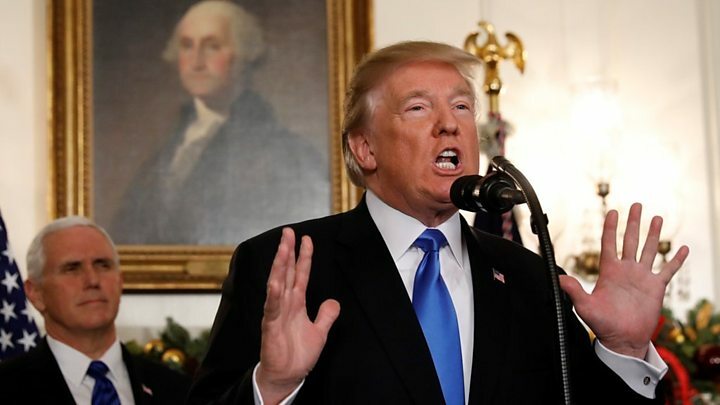 However, through all of these years, presidents representing the United States have declined to officially recognize Jerusalem as Israel's capital. In fact, we have declined to acknowledge any Israeli capital at all. 'But today we finally acknowledge the obvious. That Jerusalem is Israel's capital. This is nothing more or less than a recognition of reality. It is also the right thing to do. It's something that has to be done. 'That is why consistent with the Jerusalem embassy act, I am also directing the State Department to begin preparation to move the American embassy from Tel Aviv to Jerusalem. This will immediately begin the process of hiring architects, engineers and planners so that a new embassy, when completed, will be a magnificent tribute to peace. 'In making these announcements, I also want to make one point very clear. This decision is not intended in any way to reflect a departure from our strong commitment to facilitate a lasting peace agreement. 'We want an agreement that is a great deal for the Israelis and a great deal for the Palestinians. We are not taking a position of any final status issues including the specific boundaries of the Israeli sovereignty in Jerusalem or the resolution of contested borders. Those questions are up to the parties involved. 'The United States remains deeply committed to helping facilitate a peace agreement that is acceptable to both sides. I intend to do everything in my power to help forge such an agreement. Without question, Jerusalem is one of the most sensitive issues in those talks. 'The United States would support a two-state solution if agreed to by both sides. In the meantime, I call on all parties to maintain the status quo at Jerusalem's holy sites including the Temple Mount, also known as Haram al-Sharif. Above all, our greatest hope is for peace. The universal yearning in every human soul. 'With today's action, I reaffirm my administration's longstanding commitment to a future of peace and security for the region. There will, of course, be disagreement and dissent regarding this announcement. But we are confident that ultimately, as we work through these disagreements, we will arrive at a peace and a place far greater in understanding and cooperation. This sacred city should call forth the best in humanity. 'Lifting our sights to what is possible, not pulling us back and down to the old fights that have become so totally predictable. Peace is never beyond the grasp of those willing to reach it. 'So today we call for calm, for moderation, and for the voices of tolerance to prevail over the purveyors of hate. Our children should inherit our love, not our conflicts. I repeat the message I delivered at the historic and extraordinary summit in Saudi Arabia earlier this year: The Middle East is a region rich with culture, spirit, and history. Its people are brilliant, proud and diverse. Vibrant and strong. 'But the incredible future awaiting this region is held at bay by bloodshed, ignorance and terror. 'Vice President Pence will travel to the region in the coming days to reaffirm our commitment to work with partners throughout the Middle East to defeat radicalism that threatens the hopes and dreams of future generations. 'It is time for the many who desire peace to expel the extremists from their midsts. It is time for all civilized nations and people to respond to disagreement with reasoned debate, not violence. And it is time for young and moderate voices all across the Middle East to claim for themselves a bright and beautiful future. 'So today, let us rededicate ourselves to a path of mutual understanding and respect. Let us rethink old assumptions and open our hearts and minds to possible and possibilities. 'And finally, I ask the leaders of the region political and religious, Israeli and Palestinian, Jewish and Christian and Muslim to join us in the noble quest for lasting peace.